I’ve been writing a great deal about the cool, new technologies that we’re deploying – our secondary 1:1 program, device infusion at the elementary level, our new classroom suite that includes wireless video and voice amplification, dramatic network infrastructure improvements, virtual applications, and staff device upgrades, to name a few – but am going to devote some time today to a device type that will be phased out within our classrooms. As each building receives whole-building technology upgrades over the next four years, we’ll be phasing out hub computers within the classrooms. For those of you who may not be familiar with hub computers, they are desktop computers – like the one pictured at right – that sit on carts in each of our learning spaces, and are physically connected to the A/V cables on the wall. Many teachers use them to project to / control SMART Boards, and they are also used by substitute teachers who need computer access. The decision to phase out hub computers has been made for three primary reasons: cost and necessity. Before I go into detail about those, however, I do want to reiterate that we will not remove hub computers from a building until that building has received classroom technology upgrades. This is a critical point, as some of the functionality that the hub computer provides will be made less important through the wireless video component of the classroom technology upgrade. As I mentioned, one of the reasons that we will be phasing out hub computers is cost. Over a four year period, it costs the district about $1.2 million dollars to replace hub computers in each of our learning spaces. To put it in perspective, that amount of money would buy about 6,200 Chromebooks, enough to equip our entire secondary 1:1 program for three years, or to provide our comprehensive classroom technology upgrades in nearly 400 rooms. While cost was an important reason for the decision to phase out hub computers, I wouldn’t have been comfortable making that decision if we had no options to replace the functionality of the hub computers. As I mentioned earlier, hub computers function primarily as a control center for each classroom’s SMART Boards. With new wireless video technology, teachers can project to and use the interactive features of new interactive projectors – a SMART Board-equivalent – wirelessly, without any cable connections at all. 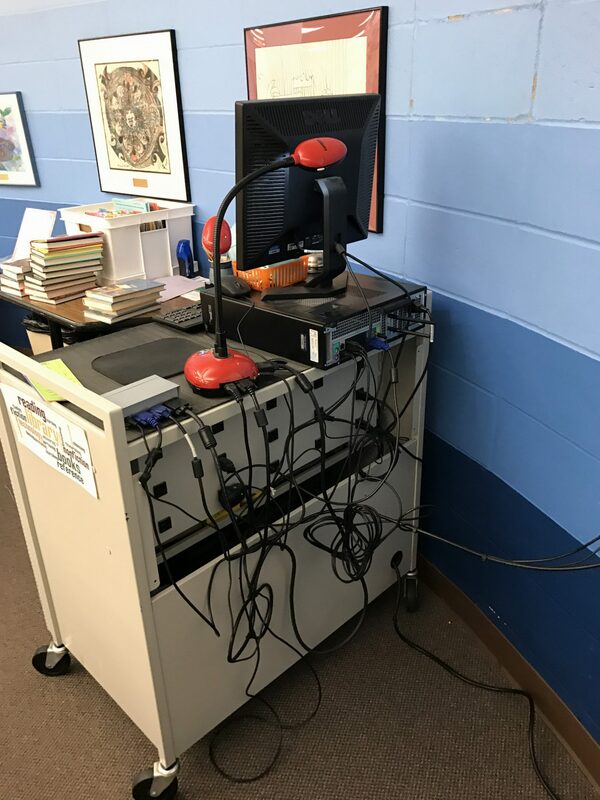 While A/V cabling will still exist within classrooms, its primary purpose will be for document cameras, or as a backup to the wireless solution. Using extended desktop for projection will allow teachers to use a single computer to control what’s being projected – still allowing for interactive functionality with the interactive projector – while displaying something completely different on the laptop screen. For teachers who use the projector / interactive screen for tasks like displaying an agenda, taking attendance, and showing presentations, a single computer is able to accomplish these tasks while simultaneously being used for other tasks. For those cases where a second instructional device is necessary, our new deployment models allow for this within our classrooms as well. At the secondary level, all teachers will be issued Chromebooks in addition to laptops. This is a bit of a change of course from earlier announcements, and is a response to the fact that Google is limiting Chrome apps to Chrome OS (they will no longer run in the Chrome browser on Windows/Mac), and Google is beginning to support Android apps on Chromebooks. While the need for this deployment is driven by a need for teachers to have access to the same technologies that students have via the 1:1 initiative, it will also introduce a second instructional device in secondary classrooms that can be used for projection, albeit not native control of the interactive functionality. At the elementary level, buildings now have discretion over their in-building deployments. While I would not argue for the hub computer model, specifically, as being of equal or greater value than student-accessible device deployments, there’s no reason that some devices – Windows computers or Chromebooks – can’t be classroom-assigned within elementary buildings, and thus available for use as a projection device when needed. I mentioned earlier that hub computers are frequently used by substitute teachers, who – like all teachers – need access to internet and network resources, projectors, and interactive whiteboards. In lieu of placing a hub computer in each room, each building will be allocated Windows-based laptops that will be available for use by substitutes, with a sufficient number allocated to each building to accommodate expected demand from substitutes, based upon previous years’ substitute teacher statistics. One of the most common requests that I’ve received since I arrived in the district last July is to remove hub computers that aren’t currently in use in specific classrooms. In some cases, teachers simply never used them; they found that managing a single computer and using it for everything, including projection and interactive functionality, was easier than managing two devices. In other cases, teachers’ hub computers were non-functional, during which time they realized that the hub wasn’t a necessity in their classroom. In basically all of these cases, a primary motivator was removing a large, bulky item from valuable real estate at the front of the classroom. It’s my hope that the new technologies that we’re deploying will fill any functionality gaps created through the removal of hub computers. More to the point, I hope that several years after hub computers are removed in each building, there is no perception of a gap in our classroom technology suite at all. In order to reach this point, my department will have to step up to make sure that teachers are trained with regard to the use of alternative technologies – such as wireless video – so that the transition will be as seamless as possible.